A resonator kit delivers the essential parts of a resonator guitar to your door so you can assemble it yourself. These kits allow you to build a high quality resonator guitar that costs considerably less than one you would buy at the music store. Although it takes hard work and careful organization, the process of building your own resonator can be richly rewarding. A squareneck resonator sits in the lap in the "lap steel" fashion. This kit is made by Beard Guitars, one of the premier custom resonator guitar shops in the world with decades of experience. This resonator guitar kit comes with the Beard reputation, which means it's one of the best resonator guitars on the market. But it's still important to consider the pros and cons. Pros: Beard-made resonator guitars get excellent reviews on the ResoHangout review sections. Pre-assembled Beard instruments cost far more than the cost of this kit, so you are saving money and getting a superb instrument. Also, the Squareneck model is great for musicians who love playing lap steel style or want to learn that style of playing (where the instrument sits flat on your lap). The kit includes all electronics, strings and hardware. The use of pawlonia, maple, walnut and rosewood ensures a nice quality instrument that will have great tone thanks to the woods it uses. This resonator guitar kit is one of the few that features Pawlonia wood for its body, which gives it a unique character and some unique strengths and weaknesses as well. Pros: Known as the other Balsa, Pawlonia wood is an exotic wood used for the making of koto instruments in Japan. It is lightweight yet strong, which will make your instrument easy to carry but also durable. Cons: The downside of this for some musicians will be that Pawlonia wood is a hard wood, which gives it that distinctive hard wood sound that is bright and snappy, not warm and mellow like soft woods. If you want a warmer sound for your resonator, you may want to look for another kit. If you have a passion for vintage Delta blues and you'd love to do a resonator box guitar kit at a rock-bottom price, SamAsh has the perfect product: the Electric Blues Box Slide Guitar Kit, which includes an instruction book and DVD. For about $33, the guitar kit includes all the parts you need to capture a resonator-like sound and style, but with a more affordable cigar box design that adds a nice vintage touch to your instrument. This little resonator-inspired bluesy box guitar kit is cheap, but it has won over musicians. Pros: Its average rating on Amazon is 4.6 out of 5, and players praise the kit because it does not play like a toy but has a legitimate blues guitar sound and feel. Cons: Reviewers who gave it a good rating did have a warning with it: it is exclusively a slide guitar. Its frets are painted on so you can't play chords. It's only meant for slide guitar, single-line melodic playing, and it has the basic feel and quality of a beginner's guitar. Despite this, the reviewer said it was a fun instrument for such a low price. 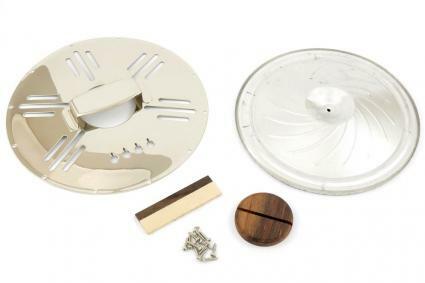 For more advanced builders, the stylish Art Deco Resonator kit by MRWS features some boutique, custom-styled resonator parts for a low price of about $56. That is just the beginning of the cost, however, because this product is for experienced luthiers. It does not come with instructions and it only has the essential resonator parts that you would need to modify or add to standard guitar parts. This kit is for advanced luthiers who want nice quality resonator parts at a cheap price. This resonator guitar kit is for the advanced luthier. Pros: Reviewers at the instrument maker's site say that the resonator has a great look and sound, and they gave it four out of five-stars for the review. Its low price will save a luthier loads of money because they can simply buy this kit and install it into a cigar box guitar or other acoustic guitar that she already owns. Cons: This kit does not come with instructions or the wood body or neck, and the seller assumes any buyer is an advanced luthier who already has an acoustic guitar or parts for an acoustic guitar and simply wants to buy this kit to modify their acoustic into a resonator. If you're not a skilled luthier, steer clear of this kit. Simple Two-page assembly guide with photos. A license plate must be purchased separately from their license plate section for about $8. This resonator guitar kit is one of the cheapest kits but adored by the DIY crowd. Pros: It has an average of five out of five stars in its reviews on its builder's site, and the comments reveal the enthusiasm of each customer. They enjoyed the unique look and style of it and the helpful instructions. It's not overly complicated compared to other resonator guitar kits. Cons: It does require some skill and at least a little experience in DIY projects. In some cases the customers did some modifications to improve the product such as adding bracing to screw the license plate in at the corners or cutting out the middle to let the license plate vibrate a little more to add something extra to the sound. If you don't mind the higher end prices for your kit, Resophonic Outfitters has a second resonator guitar kit for about $755 that features a roundneck style. You can upgrade the headcap and neck to ebony wood, which would bring the price to about $772. The roundneck style means you hold the instrument in your lap like a normal guitar. Like the Squareneck model above, this resonator guitar kit comes with the Beard reputation. It will be one of the best resonator guitars on the market, but it's still important to consider the pros and cons. Pros: As already noted, Beard-made resonator guitars get excellent reviews on the ResoHangout review sections. Pre-assembled Beard instruments cost far more than the cost of this kit, so you are saving money and getting a superb instrument. The roundneck model sits on your knee as a normal guitar would be positioned, so if you're not a lap steel fan but still want a Beard resonator, this is the option for you. 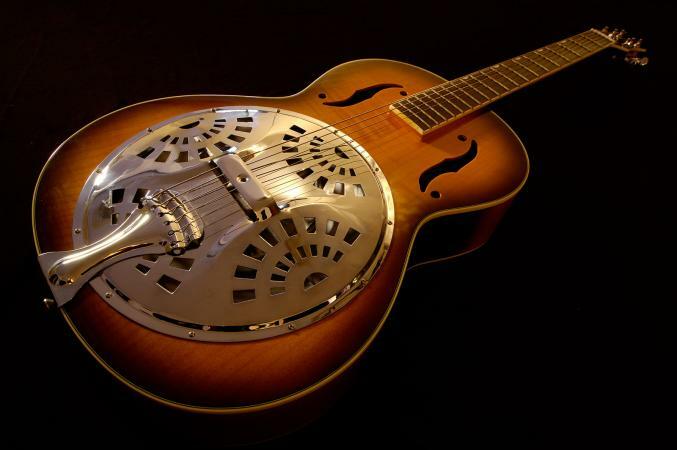 Cons: It is the more expensive option of resonator guitar kits, so if you decide to spend the money on it, it must be a project you are serious about completing. You need to be confident enough in your skills that you know you can assemble the kit properly. Also, if you don't like roundneck style resonators but prefer lap steel, this is not the kit for you. Resonator guitars are already intriguing even when they're not a DIY project. They have their own personality and sound distinct from anything else in the guitar family, which is why resonator guitar kits can be so addicting. Constructing a resonator guitar with your own hands is a truly unique experience.